Do you know that rumor about Amazon launching the Kindle Store in Brazil in November? It looks like Amazon missed their goal by about 5 days, because the Kindle Store is now up and running at Amazon.com.br. Amazon has not yet announced the launch, but if you check out the site you'll see that they're selling ebooks in Portuguese, as well as taking pre-orders on a R$ 299 black K4 (~ $ 143 USD). For now they are directing readers to download the Kindle apps, all of which already supported Brazilian Portuguese (as well as Portuguese Portuguese). The Brazilian Kindle Store is also stocking many new titles from Brazilian publishers as well as translated titles. Prices range from reasonable to the incredibly ridiculous, a detail which comes as no surprise to anyone familiar with the Brazilian ebook market. An official count of the number of titles from local Brazilian publishers is going to have to wait for the press release, but we did already know that Amazon had signed at least one major Brazilian ebook distributor. I had also gotten a hint earlier today that this Kindle Store was launching. One blog I follow discovered ebooks from Brazilian publishers on Amazon.com. Those titles were quickly removed (I expect they have since been returned). Getting back to the price of the Kindle,it looks like i may have been correct before when I wrote that Amazon was going to respond to price competition ruthlessly. 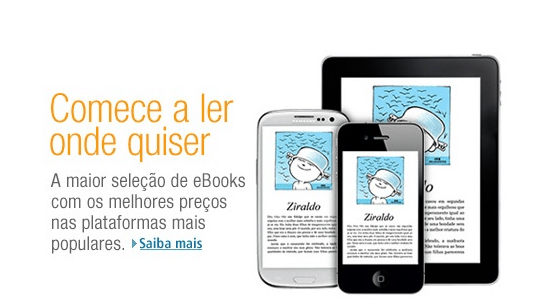 They cut the price of the Kindle Paperwhite in Japan (in response to Kobo) and now they're doing the same in Brazil. But this case didn't quite work the way I expected. Since Amazon cannot get the KPW to Brazil, they're promoting the K4 instead. And with the current price tag of the black K4, I am guessing that the KPW will eventually sell for just under the price of the Kobo Touch. That ereader launched in Brazil last week with a retail of R$ 399 (~$191 USD), and is expected to ship on 5 December.